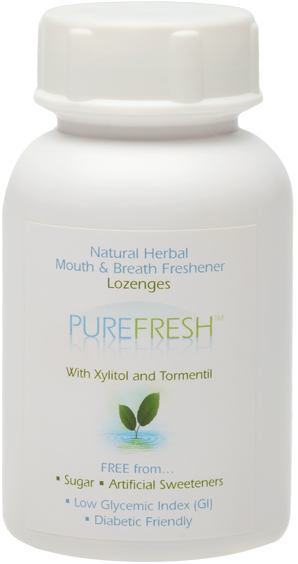 The PUREFRESH lozenges, which contain the anti-bacterial agent tormentil, can be sucked throughout the day to keep your breath and teeth fresh, smooth and clean. The convenient daypack that comes with every bottle makes it easy to carry just enough lozenges to use before meetings, after meals or when your mouth feels stale. 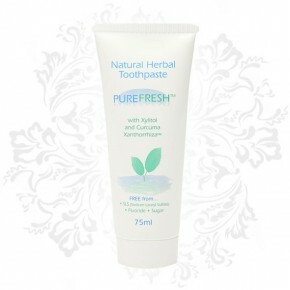 The PUREFRESH range offers a completely natural approach to oral and dental healthcare as it is formulated from pure plant extracts and contains no fluoride, sugar, sodium lauryl sulphate (SLS) or sodium laureth sulphate (SLES). The range, which consists of a natural herbal toothpaste, oral rinse and through-the-day lozenges is based on curcuma xanthorrhiza (CXE) and xylitol. Studies done at the Department of Preventative Dentistry and Public Oral Health in Seoul, South Korea showed that a combination of CXE and xylitol inhibited the growth of Planktonic S. mutans and S. mutans biofilm (plaque) by 73%. The results from additional research conducted by scientists at the Yonsei University in Seoul also proved CXE also acted against the bacteria that cause periodontitis and gingivitis. To enhance the healing properties of the range, additional ingredients such as rhatany root (for mucosa inflammation, gingivitis and ulcerated and spongy gums), schisandra sphenanthera (for inflammation, pain and fever), sage (for abscesses, infected gums and mouth ulcers), myrrh (for wounds ulcers and halitosis), kaolin (for whiter and cleaner teeth) and peppermint (to improve taste and heal) have been added. Using the PUREFRESH range, which is free from carcinogenic, cariogenic, bacterial and fungal fostering elements will safely protect and heal your mouth and teeth the natural way.